Reach and beat your Triathlon training goals in Abu Dhabi with these new cycling for triathlon fitness classes. These classes are part of our new ‘Triathlon Training’ set in Abu Dhabi. Our exciting NEW Triathlon Program is led by Coach Jason. Jason’s sports career spans nearly 20 years not only as a Sports Coach but also a seasoned athlete. Jason works as a Swimming Coach embracing his true passion of teaching people to swim, Jason teaches from Aqua Baby to Olympic Swim Professionals. His sporting achievements include 4 Comrades Marathon Races 89km each, 7 Full Ironman, 15 Half Ironman, and numerous 7km & 9km open water swims. No-one knows better how to achieve your best in a Triathlon, with Jason’s wealth of experience this new program will certainly help you improve on your times and achievements. Jason Wagner is the swim fitness instructor for swimming for fitness class in Abu Dhabi. 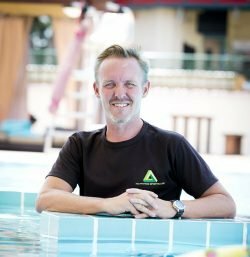 Jason has many years of swimming and swim related fitness experience working with both adults and children in Abu Dhabi.